P1: Woola, the calot, delays the guards on the stairway as Dejah Thoris seeks vainly to unlock the man's shackles. "Use my shortsword as a lever to turn the rusty key," John Carter commands the girl. P2: His weapons had been left on him and when at last the old lock opens, Carter's sword arm swings into deathly action as the first Thark leaps toward them. P3: Now both arms are free and the fight rages on the narrow balcony as the green Tharks seek to avenge their ruler's death. P4: Suddenly Carter's short sword sings through the air, and pins a Thark to the wall. P5: Using the Thark's suspended body as a step, the Earthman swings himself and the girl to an upper window ledge, pulling his shortsword from the Thark's neck as he passes. P6: "Quickly, Dejah Thoris, follow the corridor to the far window -- the devils are right behind us!" P7: As she promised, Sola, the green woman, is waiting in the street far below with mounts to aid them escape. P8: "Hurry, John Carter -- warriors are running fast out of the palace. There is no time to waste!" 1. All of the scenes in strip #7, up through panel 4, are unique to the Sunday strip. In panel 5, where the couple escape through an open window, the action rejoins the story told in issue #35 of The Funnies: ("Quickly! Dejah Thoris -- to the window, the devils are right behind us!") ("You're sure Sola will be waiting for us with thoats to ride?") 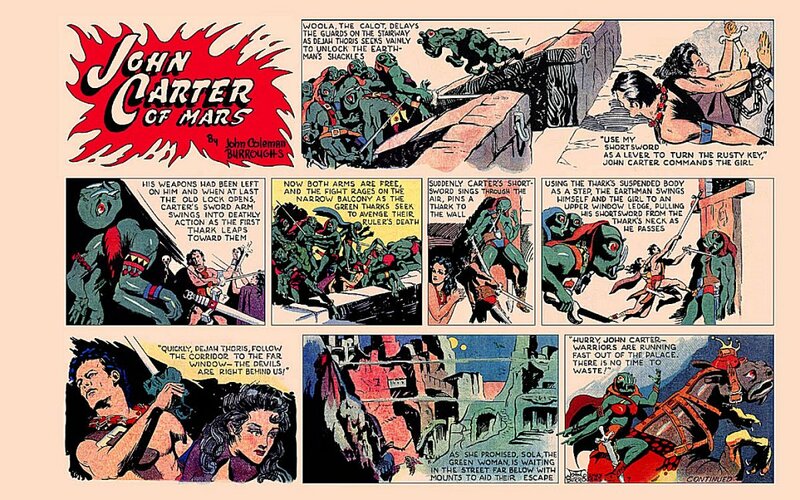 ... As the pursuing Tharks rush up behind, John Carter plunges out of the high window -- one steel-muscled arm gripping Dejah Thoris. 2. In ERB's original story, Sola accompanies the escaping couple, through the window and to a courtyard where Carter had previously secreted saddled and provisioned thoats for their escape from Thark. The version told in the two comics narratives has Sola waiting with the mounts, outside the palace. This is a more effective plot element and should be retained in the novelization. 3. In ERB's original story, Woola later catches up to the fleeing trio, but in the Sunday strip version he remains with Carter and the princess, as they attempt to ellude armed guards. This can be kept in the novelization, then Woola can be separated from the refugees, then (as in ERB's story) he can later be reunited with them. CHAPTER 7: "The Old Lock Opens"
In the jargon of the green warriors, calots are referred to as "loin-rippers." The many-toothed, eight-legged Martian watchdog has sufficient power and deftness to leap to a giant's throat if need be, but Woola was cunning enough to charge under the tall guards' sword-points. Nor did he stop to savor the hot blood spurting from one gaping wound before hurling his piercing tusks and rending teeth upon the vitals of some other vulnerable victim. Such are the tactics of the trained Barsoomian war-hound and they can be incredibly effective in disrupting the coordinated efforts of a tightly grouped squad of infantry. This unnerving attack completely unbalanced two of the palace watchmen, sending them crashing into the hallway walls on either side of the battered-down door. Woola's savage fury also forced several green swordsmen back upon their four lower limbs, an awkward position for maneuvering in closely confined spaces. Precious seconds were gained by the calot's delaying tactics and in those few seconds John Carter sprang open the wrist lock. His chains fell against the wall with a loud clank; he was free! The Virginian felt a great desire to leap to the end of the hallway and measure swords with the green brutes. The few hours he had spent in practice fights among the chieftains at Korad convinced him that he could successfully take on two or more of the giants at one time, if they kept their pistols out of the fray and fought with blades alone. But there are times when retreat is a soldier's best choice and the Earthman felt no shame in backing away from such an uneven contest. "Quickly, John Carter! To the double window in the throne room!" commanded the princess. The bronzed swordsman sent a mental order to his watchdog, to fall back and join him. Gathering his scant possessions in one hand, he grasped Dejah Thoris by the other and they sped quickly from the entrance hall and back into the neighboring throne chamber. Tal Hajus still rested face down in a pool of his own blood. Beyond, high in the wall at the level of a green man's head, was a modern addition to the prehistoric architecture -- the Tharks of recent times had punched two overlapping holes in the plastered wall and had dressed the edges of the twin window with rough stone slabs. Beyond that he could see nothing but the jet black of an overcast Barsoomian night. John Carter dodged around the monstrous obstacle and took the shortest path to the open window. Along the way the fleeing pair passed the two large torches that supplied the room with most of its illumination. These they knocked down, leaving only their smoldering embers and the eerie glow of a single radium lamp to light the huge chamber. The charging guards followed, shouting the general alarm, only a few yards behind. The throne room was as still as a tomb and almost as dark. The green men slowed their pace, peering into the shadows. Upon sighting their fallen jeddak all but two of the squad formed a ring around the prone monster. While most of the guards were occupied in examining the motionless hulk on the floor, the other two swordsmen quckly searched behind the room's decayed tapestries. Then, from out of the darkness, Woola struck again! The swift sharp strikes of John Carter's long-sword and Woola's fangs immediately sent the two searchers to the realm of their ancestors, covered in blood. In the shadows a series of events then transpired in such rapid succession as to defy any proper description. The two humans and the calot reached the huge open window even before the last of the guards ran into the room. The Earthman lifted the girl so that she could pull herself onto the window ledge, then stood with sword ready to meet onrushing foe. Realizing that their prey was about to escape, one of the senior guards called for firearms. Guns were normally forbidden in those chambers and another minute's time was lost while the Tharks retrieved a loaded pistol from an anteroom. By then John Carter had turned and leaped to the broad stone ledge beside the red princess. When the gun-toting Thark took aim, all he saw were two pairs of sandals, disappearing from view into the night. Another guard hurled his short sword at the calot, but Woola dodged the missile and jumped up onto the vacant windowsill. The nearest green giant was by then within striking distance but his long-sword slashed down upon empty ersite. The calot too had disappeared! It was late evening when Sola wrote the message on John Carter's pistol strap. She handed the gunbelt back to her father a short time before Tars Tarkas was summoned forth to exhibit his two human captives before the august presence of the Jeddak of Thark. "Will this design succeed?" she questioned. But the big warrior motioned the inquiring girl to be on her way. His only words to her came in a cryptic murmur: "Tell no one of tonight's events -- ever. Even the life of a jeddak must end, sooner or later. If you survive you will know what to do." She departed the jeddak's residence without a backward glance and carried her father's dismissal orders out to the small retinue that had accompanied them into Thark. Then, taking with her three of the thoats they had brought to the palace, she circled behind the massive structure to the ancient city arboretum adjacent to the private courtyard of Tal Hajus. In a patch of rank undergrowth, untended for millennia, Sola concealed the mounts from the nearby pacing guards. Except for three armed sentinels there was not a person in sight. In the deepening gloom before the rising of the larger moon she watched and waited. "How have I come to this?" she wondered. "A day ago, if I had been told all of this would be happening, I could not have believed it! What is going on in me? I do not want to be like the humans. I want to be -- I want to be, myself. And that is the only thing in the world that frightens me. A Thark is never afraid, but tonight I know what fear is, and I do not like it!" This self-searching was such a new thing in her life that Sola did not even know what to call it. So she called it "fear." What she did know was that she had promised her father she would never speak of the night's events. All of Thark might call her a water-hearted traitor, but no green denizen of Barsoom would ever call her father that. Because -- nobody need ever know that she was truly the daughter of Tars Tarkas, the high chieftain who one day would rule all Thark in the place of the self-serving and ineffective Tal Hajus There! -- she had said it in her mind and therefore, sooner or later it must happen. A sudden alarm summoned two of the armed sentries into the palace, but one remained behind at the courtyard gate. This was no time for a noisy face-to-face confrontation. There had to be some way to get past the lone guardsman quickly. The girl gathered her thoughts and then slapped one of the thoats on the flank, sending it galloping onto the circular avenue and past the startled warrior. He turned and pursued the speeding shadow down the roadway into the dark, overgrown woods. The unguarded courtyard gate stood wide open, allowing the girl and the steeds easy access. A half dozen heartbeats later a pair of small figures appeared in the double window far above. Sola positioned the two remaining thoats below the window and concentrated all of her thoughts into a single mental message. "Hurry, John Carter -- warriors are coming. There is no time to waste!